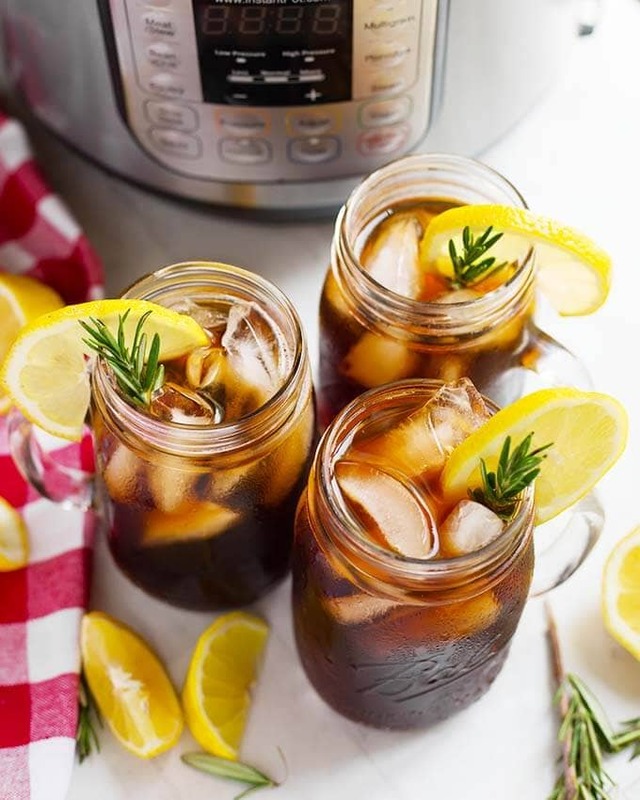 Instant Pot Iced Tea is refreshing and very easy to make. I like it better than stove top iced tea because it is stronger, and not at all bitter! 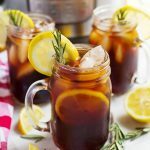 Pressure cooker iced tea is my drink of the summer! I have always liked iced tea, and have made many varieties many ways. I remember making sun tea in the back yard, only to have the clouds roll in, or the rain come down. Yep, Seattle. Even on the sunny days that tea took all day to make, and I had to use at least 12-14 tea bags to get it strong enough for my liking. And a lot of sugar! Boiling water on the stove top is not a big deal, but if I poured it over my tea bags and forgot about them the tea became bitter. Not enough sugar to fix that! So, since these days we are making EVERYTHING in the pressure cooker, I decided to make a peach flavored iced tea in my Instant Pot. It was really good, and so I just kept experimenting. It was nice to just walk away and do my work without having to watch the kettle or remember to remove those tea bags! My favorite black tea for Instant Pot Iced Tea is Newman’s Own organic black tea, and I buy their family size bags. 1 family sized tea bag is equal to 4 regular sized tea bags. 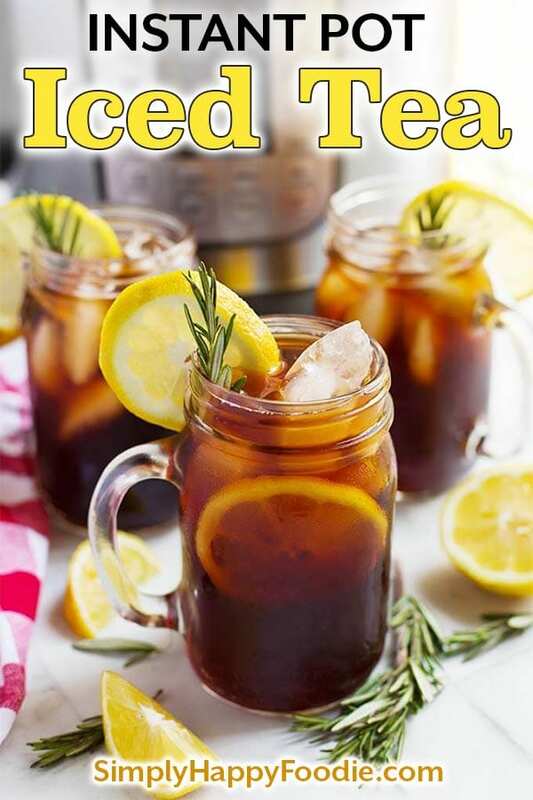 You can use any tea that you would normally make iced tea from. Just add 1 Tbsp of Peach Simple Syrup to your cup of tea and stir it well. Taste and add more if you want it sweeter. 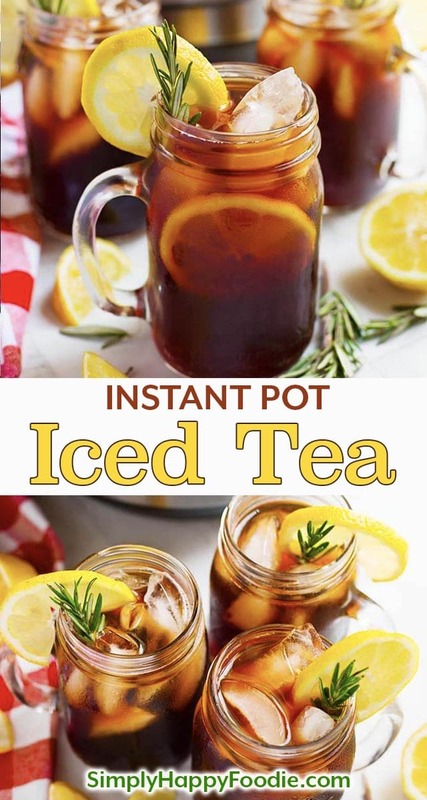 Instant Pot Iced Tea is refreshing and very easy to make. 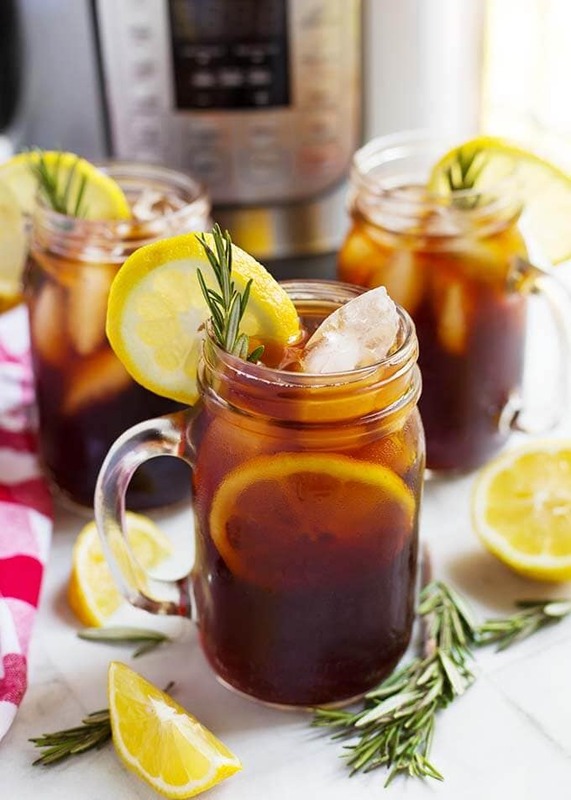 Pressure cooker iced tea is not bitter, and you can make it as strong as you like. 4 Lemon Wedges (optional) add after pressure cooking while still hot. Let steep. Pour the water into the inner liner of the pressure cooker. Add the sugar, if using, and stir (You can add the sugar after pressure cooking if you'd prefer to taste it first). Add the tea bags. Close the lid and set the steam release knob to the Sealing position. Press the Pressure Cook (Manual) button or dial and then the +/- to select 4 minutes. It will take a few minutes to come to pressure. After cook cycle has finished, turn off the pot and let the pot sit undisturbed for 20-30 minutes. This will keep the tea from becoming bitter (Quick Release makes the water boil, causing bitterness). Manually release the remaining pressure/steam. There shouldn't be much left. When the pin in the lid drops back down, open the lid and remove the tea bags. Add sugar, stir, and taste. Start with the lesser amount and add more, if desired. Serve over ice and garnish as you like. To make the peach Iced tea I mentioned in the post, start with 1 Tbsp of Peach Simple Syrup in 8 oz glass of the iced tea. Then taste and add more if you wish. I am in shock. This iced tea is the best! Why isn’t it bitter? Mins is always too bitter when I try to make it stronger. Is this a science thing? Hahahahaha Faye! Yes, it is a science thing. I’m no scientist, but it has something to do with how the water heats, and the boiling temperature. See, I’m no scientist. Anyway, I’m so glad you liked this iced tea recipe! Thanks for the comment! Any idea how much honey one would put in to make green iced tea? Thank you! I would start with 1/4 cup, mix it well, then add some more if needed. Add the honey when the tea has cooled so it retains its good benefits. It was really good! i did it plain, no sugar, but when it was done i put a put a few heaping teaspoons of frozen lemonade concentrate, it was perfect!!!! Thank you for this recipe. When you say “family” sized tea bags, do you mean the gallon size tea bags? I have those and want to make a gallon of tea so could you help me with the measurements and such? We love iced tea and have been buying a power sugar free mix with chemicals galore (my hubby is diabetic and thought they were better). I want to make natural tea instead for us and use agave to sweeten too. The family size tea bag is for 1 quart of water. I assume the typical size tea bag is for 1 cup of water. If you have a tea bag that makes a gallon, that might be too much for the 6 qt pot, but may work in the 8 qt. I like my tea a little stronger, so I use 3 family size tea bags to 8 cups of water (1/2 gallon). If you use a tea bag that makes a gallon, you can double my recipe and just use your tea bag. I hope that makes sense! If you wanted to scale this up to say a gallon or whatever the max volume or a gallon would the times need to change? Doubling the recipe would make a gallon. The times do not change.